California is the largest state of the United States by population, and the third largest by area, located on its coast to the Pacific Ocean. California has natural attractions as well as theme-parks and bustling city life: Southern California is home to such popular attractions as Disneyland, Hollywood and the beaches in Malibu that inspired the television show Baywatch, while the northern part of California offers the iconic Golden Gate Bridge, the hills of San Francisco, the vineyards of Napa Valley, Silicon Valley, and the capital, Sacramento. Outside California's major cities one finds some of North America's most rugged national parks, incredible skiing/snowboarding opportunities, and quiet and ancient northern forests including the highest mountain peak in the contiguous USA, Mt. Whitney. California varies greatly, ranging from the forested northern coastal regions to the rugged interior mountains to the harsh southern desert. Sandwiched in the center of California is the fertile Central Valley, home to a massive amount of agriculture. Home to Los Angeles, San Diego, Disneyland, and miles of famous beaches. Palm trees, blazing sun, and quirky resorts. An isolated stretch of land that features cool mountains and rugged coastline. Breadbasket of California and home to a large percentage of America's fruit and vegetable supply. Home of Sacramento. the state capital. California's alpine and skiing region, including Yosemite National Park and Lake Tahoe. Historic foothills to the Sierras. Home to San Francisco, Oakland, and San Jose/Silicon Valley. Home to the world's tallest trees, the coast redwoods as well rugged coastline and remote nature adventures. Hills and mountains in the state's northeast corner that are off the beaten path for most visitors. These are some of the major cities in California. Sacramento - This metropolitan area sited amongst the fertile flatlands of the Central Valley, between the San Francisco Bay and Sierra Nevada mountains, hosts the state capitol and the 19th century historic area Old Sacramento. Bakersfield- The largest city of the southernmost San Joaquin valley, this is an important producer of oil and agriculture. Blazing hot in the summer with poor air quality, but at the foot of the Sierra Nevada's cooler and clearer altitudes and midway between San Francisco and Los Angeles. The world's largest Basque population outside of Spain is found here and fine Basque restaurants abound. Fresno- Urban center of the Mid-San Joaquin Valley. Gateway to the prime national parks of the highest Sierra Nevada mountains: Yosemite, Sequoia, and Kings Canyon. Los Angeles - The state's largest city, and 2nd-largest in the nation. L.A. is home to Hollywood, Venice, The Getty Center, and Griffith Park. Palm Springs- Desert recreation with golf, spas, resorts, casinos, and the famous aerial tramway. San Diego- Beach towns, Balboa Park, Old Town, SeaWorld, San Diego Zoo, and nearby Tijuana, Mexico. San Francisco- Golden Gate Bridge, Alcatraz, America's largest Chinatown, cable cars, Victorian houses, mecca of cultural, ethnic and sexuality. San Jose- Near San Francisco but with a distinct identity, home of the Winchester Mystery House, and the center of Silicon Valley, which is home to many technology companies. Santa Cruz - A central coast city. The home of the historic Santa Cruz Beach Boardwalk, Mission Santa Cruz, and the Mystery Spot. Lake Tahoe — A large, gorgeous lake great for water sports and excellent skiing in the winter. Napa Valley — Spas, wine tasting, wine tours. Siskiyou County — is in the Shasta Cascades region of California. Death Valley National Park - The lowest point in North America. Desert park and brutally hot in summer. San Bernardino National Forest - Wilderness preserved against sprawling urban development in the region. Human occupation in California goes back 50,000 years; California was home to thirty different tribal groups prior to the arrival of European explorers in the 1500s and now over 120 tribes are left. The first Europeans were the Spanish and Portuguese, who built a settlement in California, establishing twenty-one missions in California by the late 1700s. Many of these missions survive today, including that in Santa Barbara. After the Mexican War for Independence in 1821, California became a part of Mexico for 25 years until 1846 where it briefly became a sovereign nation, California Republic, before it was annexed by the United States in 1846. In 1848 the discovery of gold in the Sierra Nevada mountains kicked off the California Gold Rush, and California's non-native population surged from 15,000 to over 300,000 within two years. California was recognized as a state in 1850, and its population increased steadily since then. Today California is the most populous state in the US with over 38 million residents. With over 160,000 square miles (411,000 km2) the landscape of California is vast and varied. The state contains extremes in elevation, with Mount Whitney at 14,505 feet (4,421 m) being the tallest mountain in the lower-48 states, while less than 200 miles away Death Valley, at 282 feet (-82 m) below sea level, is North America's lowest point. California's border to the west is made up of a rugged coastline along the Pacific Ocean. The coastal mountains rise up from the ocean and are home to redwood trees in the northern half. 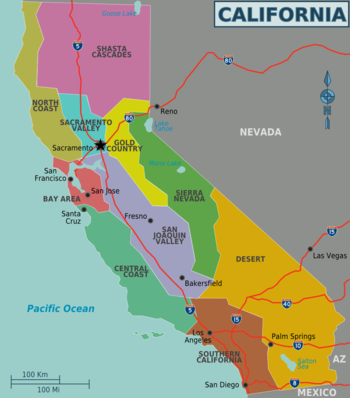 The Central Valley bisects California from north-to-south before giving way to the Sierra Nevada mountains, home of Yosemite National Park, Sequoia and Kings Canyon National Parks and other natural wonders. The southeastern part of California is dominated by desert, which covers 25% of California's total area. The Mojave is a high desert, with elevations ranging from 3,000 to 6,000 feet above sea level. This area receives less than six inches of rain each year. The state's climate varies from temperate at the coast to the brutal winters of the mountains to one of the world's hottest regions in the deserts. Rainfall is more common in the northern part of the state than in the south, and snow is rare except in the mountains. The hottest temperature ever recorded in the Western Hemisphere, 134°F (56.6°C) was at Death Valley in 1913, and temperatures regularly exceed 120°F (49°C) during the summer. In contrast, winter temperatures in the mountains can drop below 0°F. California is a very diverse state with many ethnic groups. California has large populations of people of varied backgrounds such as Mexican, Salvadoran, Guatemalan, Armenian, Iranian, Irish, Jewish, Chinese, Russian, Filipino, Eastern Indian, Korean, Japanese, Vietnamese, Cambodian, Thai, and Hmong. California also has large populations of African Americans and Native Americans. Californians have a wide variety of political views. The Central Valley, Orange County, San Diego, and Palm Springs area tend to be more conservative, while Los Angeles County and the San Francisco Bay area tend to be more liberal. California is a very large and populous state, with very different cultures in each region. All major road entrances (including entrances from other U.S. States) to California have agricultural inspection stations to ensure that some fruits and vegetables do not cross into a region where they may come into contact with the farms in the Central Valley. Often, travelers are subject to border inspection (somewhat strict for domestic travel) and asked if they have been on a farm or are carrying organic matter with them. Like most American cities, most cities in California have an international airport. The largest is Los Angeles International Airport (LAX) with flights to six continents. Another major international airport is the San Francisco International Airport (SFO). SFO has many flights to Europe and is an important gateway to and from Asia, given its relatively close proximity to the continent. There are also several smaller airports in the vicinity of SFO (Oakland, San Jose, Sacramento) and LAX (Burbank, San Diego, Santa Ana, Long Beach, Santa Barbara, Ontario), but the largest selection (by far) of domestic and international flights can be found at these two airports. Many of the smaller airports in the state have flights to Western U.S. hubs such as Denver, Phoenix or Seattle. Amtrak has hubs in Emeryville and Los Angeles Union Station, with service on routes in the Western U.S.
Greyhound, Megabus and others come from Portland, Reno, Las Vegas, Phoenix and Mexico. California is the third largest state of the US in terms of size. It compares in size with Sweden. However, getting around California can be simple. Also, California has a variety of climate you can choose to live/visit in; from deserts to beautiful beaches to cold beaches to snowy areas to dry-hot areas to overcast cities to farmland to open grass hills and more! A wonderful place if you want to experience these different climates throughout the year without breaking the bank. In addition to interstates and US highways, California has one of the most expansive state highway systems in the United States. As with all trips in the United States, a car is usually the best way to get around and see all destinations. However the trip from the top of California to the bottom can take well over ten hours. The coast route (State Route 1 and US 101) is much slower and windier than Interstate 5, and GPS travel estimate times may be inaccurate - especially on Highway 1. Most California drivers are courteous and careful (although speeding is rampant), and the safety and ease of driving in California is comparable to most First World industrialized countries. Exceptions may be found in the most congested areas of San Francisco and Los Angeles, where road rage, reckless driving and red-light running are commonplace. California uses the MUTCD (Manual on Uniform Traffic Control Devices) lane marking system standard throughout the United States, in which dashed white lines divide lanes of through traffic and yellow divides opposing traffic (with single dashed indicating passing and double solid indicating no passing). In many urban areas the lane markings are replaced by Botts dots for additional tactile feedback when crossing lanes. The network of freeways in major population centers is often confusing and intimidating to those unfamiliar with the area, so having a good map is very helpful. Almost all exits from freeways are on the right. At interchanges between freeways, in most cases, the flow of traffic continues through the left lanes with the transition to the other freeway being in the right lanes. Note that at certain freeway interchanges, Caltrans is notorious for posting advance direction signs that do not correctly explain which lanes correspond to which ramps. Additionally, Caltrans does not always consistently post signs warning of upcoming lane drops or merges. For example, where a freeway has three through lanes and the central lane splits into two lanes, thus resulting in two ramps with two lanes each, the advance signage may incorrectly imply that only the right lane will break off for the upcoming right-side ramp, thus causing visitors driving in the middle lane to merge unnecessarily into the right lane. And the two lanes on the right-side ramp may suddenly merge into each other without any warning. These issues frequently result in tourists making wild last-minute lane merges. The 2009 national MUTCD is intended to remediate this problem (as seen in California and several other states) by mandating the use of detailed arrows on direction signs that clearly show which lanes split into new lanes at upcoming interchanges, but only a handful of California interchanges rebuilt after 2009 have implemented the new MUTCD standard. Thus, one should always approach major freeway interchanges in California with caution. Mile-based exit numbering is currently in progress but is still very erratic in areas; an exit number may not be marked at all, may be marked on the last directional sign before the exit, or may be marked on the final "EXIT" sign itself where the exit ramp separates. Most highways are freely accessible, although there are a handful of toll roads in Orange County, Riverside County, and San Diego. All major bridges in the San Francisco Bay Area have toll plazas on traffic in only one direction. All California toll plazas have cash lanes, with the exception of those at the Golden Gate Bridge, which no longer accepts cash tolls. Cash toll lanes are usually manned by human toll collectors, but some of the Orange County toll roads use only vending machines in the cash lanes which accept bills and coins. California toll plazas do not have "exact change" lanes where drivers may toss change in a basket. All California toll plazas also have lanes for FasTrak electronic toll collection transponders which can be used throughout the state. FasTrak is not compatible with any other state or country's ETC system. Driving through a FasTrack only lane without a transponder or a active account is illegal and will result in you paying a huge fine. All toll bridges and toll roads have signage for a "last exit before toll," which you should take if you do not have a FasTrak transponder or enough cash to pay the toll. In major metropolitan areas, the access ramps to a freeway may have two lanes, one marked with a diamond and the other with a traffic signal. The diamond lane (called the "carpool lane") is for vehicles with two or more persons and motorcycles. Vehicles with a single person must use the lane with the traffic light. During high-traffic times, the traffic light spaces out the vehicles attempting to merge onto the freeway. Be sure to read the sign below the light as some ramps allow two or three vehicles per green. A few interchanges between freeways are now using controlled access lights to lighten the gridlock at interchanges. Some freeways have a high occupancy vehicle (HOV) lane located along the center divider. This lane, also called the carpool lane, is marked by signage on the wall separating the two sides of the freeway, and in Southern California is additionally marked by a double-yellow line (or in a few places, a double-white line in accordance with the newest version of the MUTCD). In most cases, this lane is for two or more persons per vehicle. Some carpool lanes in Northern California are in effect during rush hour only, and a few selected areas, notably in the Bay Area, require three or more per vehicle, so check the signage before entering a carpool lane. Motorcycles may also use carpool lanes. Carpool lanes in Southern California are usually in effect 24 hours a day, and have limited access points marked by a dashed white line. These points are the only points at which a vehicle may legally enter or exit a carpool lane, since under the MUTCD, drivers are not allowed to merge across a double yellow line. The minimum fine for unlawful use of a carpool lane is $341. State law requires all person in a vehicle to wearing a seatbelt. Failing to do so can result in the driver and all passengers can be individually ticketed. Motorcycle riders must wear a helmet. Cellphone users are required to use a hands-free headset if talking on the phone while driving, and texting while driving is illegal. Unless otherwise signed, right-turns are permitted at red lights following a full stop. If it is raining hard enough to require you to use your windshield wipers, California law requires that your headlights be turned on. California does not have stationary photo radar cameras like in other countries, and mobile manned photo radar units are rare and still experimental. However, most California police officers do carry radar guns and use them often, and on rural freeways, the California Highway Patrol occasionally flies aircraft overhead to spot speeders and help ground units hone in on their positions. Red light enforcement cameras are in use at many urban intersections, but are usually marked only by a single "PHOTO ENFORCED" sign before the intersection. Even more confusing, all approaches to an intersection may be marked with "PHOTO ENFORCED" signs when only one or two actual movements across the intersection are really photo-enforced. The cameras must obtain a clear view of the driver's face and license plate before a ticket may be issued. California's laws against driving under the influence of alcohol are very strict. The maximum permissible blood alcohol concentration for drivers of noncommercial vehicles is 0.08%; for commercial vehicles, it is 0.04%. All drivers are strongly encouraged to call 911 to report drunk drivers. Flying may be a more reasonable option from crossing large expanses of the state. Many airlines such as American Airlines and American Eagle, Alaska, United & United Express, Jetblue, Virgin America, Delta and Delta Connection and Southwest offer intra-state (within the state) service. San Francisco Bay Area--San Francisco (SFO), Oakland (OAK) and San Jose Mineta (SJC). The next busiest second tier airports are Santa Barbara (SBA)  and Palm Springs (PSP) . Amtrak Thruway Motorcoach (buses) connect between ends of the train routes such as the San Jose - Santa Cruz - San Luis Obispo or a continuation of a train route such as the Emeryville - downtwon San Francisco route. There are multiple Thruway routes throughout the state. BART operates in and around the SF Bay Area on multiple routes. COASTER runs along the coast from Oceanside to downtown San Diego in San Diego County. There are also light rail systems in San Diego, Los Angeles, San Francisco, Sacramento, and San Jose. A comprehensive map of the various California rail services can be found at California Rail Map , including connection points between services. The bus is not the most glamorous way to get around the state, but usually the cheapest. Greyhound serves about 100 locations statewide, though these are not all actual stations, some are merely stops. In general, Greyhound serves the same routes that Amtrak does, though in some cases the dog is cheaper, faster, or more frequent. There's fairly frequent service between San Francisco and Los Angeles, San Francisco and Sacramento, and Sacramento and Los Angeles. There's hourly "clocker" buses between Los Angeles and San Diego. The bus stations in San Francisco, Sacramento, and San Diego are all well-located, but in Los Angeles the station is over a mile east of the downtown core. On the other hand, the Santa Barbara Greyhound station is immediately behind the very upscale Saks Fifth Avenue store! See 511.ORG for a trip planner program on getting around the greater San Francisco Bay area which consists of Alameda, San Francisco, Santa Clara, San Benito, San Mateo, Contra Costa, Marin, Napa, Santa Cruz, Solano, and Sonoma County by public transport. Each county and some of the cities within operate their own public transport (bus and cross bay ferries) service in addition to BART, , Capitol Corridor Train, and Caltrains. See ie511.org for a trip planner program and links to various public transport providers in the greater Los Angeles metroplex which consists of Los Angeles, Orange, Riverside, San Bernardino, and Ventura Counties. Each county and some of the cities within operate their own public transport service in addition to Metrolink Trains. The California Constitution states that English is the official language of the state of California, Californian English is the main language and Spanish is the de facto second language, and a knowledge of even rudimentary Spanish is useful, but not a necessity in most places. Los Angeles has some of the largest Hispanic populations north of Mexico. The state is highly influenced by Spanish culture, as California was one part of the Spanish empire until 1821, and then to Mexico for a short while after until ceded to the USA in 1848. In fact, some of its residents declared it an independent country for about a month (The Bear Flag Republic) in the midst of the Mexican-American War 1846-1848, and many of California's cities were named after saints or phrases in Spanish (such as Los Angeles, San Diego, San Francisco, Sacramento, and San Jose). Store and street signs are sometimes written in both English and Spanish in major metropolitan areas, and "Spanglish" (a mixture of English and Spanish) is often used and heard throughout the state. Most businesses in California have at least a few employees that are bilingual in English and Spanish. Also, Armenian, Chinese, Japanese, Tagalog, Korean, Vietnamese, Hindi, Punjabi, and Khmer are also widely spoken among Asian Californian populations. Despite all the languages that are spoken, a foundational knowledge of either English or Spanish is more than enough to ensure a successful trip to California. All people that you are likely to encounter speak English, and Spanish is studied as a second language in schools by many young people and is also spoken natively by many service industry workers. That said, English is emphatically the more useful of the two. Los Angeles, home to the world-famous Hollywood sign, the Walk of Fame, the Graumann's Chinese Theater, Beverly Hills and Rodeo Drive, and miles of wide, sandy beaches. San Francisco, with the iconic Golden Gate Bridge, Alcatraz, a large Chinatown, Italian North Beach, cable cars, and numerous hills. Santa Barbara, city on a south-facing coast which styles itself, with some justification, as "the American Riviera." Ski at one of the great resorts near Lake Tahoe or Big Bear. Try your hand at surfing or work on your tanning Orange County or Santa Monica. The long coastline offers some great California scuba diving. 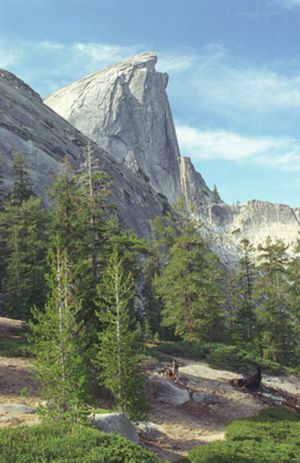 Climb a mountain and camp in the Sierra Nevada or Shasta Cascades. See California's amazing wildflowers.California Wildflower Hotline, (818) 768-3533, . From March through May, the California Wildflower Hotline at (818) 768-3533 or visit www.theodorepayne.org offers the latest information on the best places to view wildflowers throughout Southern and Central California. The hotline and website are updated every Thursday evening. More than 90 wildflower sites are included. The hotline, operating more than 25 years, is run by the Theodore Payne Foundation for Wild Flowers and Native Plants, Inc.
Northern California Blues Festival,  Fastest growing festival of its kind comes in June to Sacramento County around Father's day each year and usually features a spectacular line-up of Blues artists. Event benefits Through the Mind, a non-profit providing free alternative mental health to America's Veterans. California sales tax varies from 7.5% in rural areas to as high as 10.0% in certain cities. The State Board of Equalization maintains up-to-date charts of sales taxes for all California cities and counties. Sales tax is charged on all goods but not services. It is not included in prices (with the exception of gasoline) and is normally calculated and charged at the cashier. California retail receipts always show a "subtotal," then the amount of sales tax, then the real "total" obtained by adding the two. Like most U.S. states, California sales tax is not refundable for tourists from out-of-state. Regardless, because sales tax is charged only at the final point of sale (unlike a value-added tax which is levied on every producer in the chain), California prices (even after tax is accounted for) are often still very affordable for tourists visiting from countries that charge high import tariffs and VAT for the same goods. The major department stores in California include Neiman Marcus, Saks Fifth Avenue, Nordstrom, Bloomingdale's, Macy's, JCPenney, Sears, and Kohls. The first four are considered upscale. Macy's is mostly midrange and most stores feature its own store brands. However, Macy's also carries upscale designer label merchandise at select stores in wealthy areas like San Francisco and Costa Mesa. JCPenney, Sears, and Kohls target a middle-class to working-class market. If you are visiting California on an escorted tour package and will be visiting San Francisco and Los Angeles in the same trip, plan on doing most of your department store shopping at the giant West Coast flagship stores in Union Square in San Francisco. Although Los Angeles is the second largest city in America and the most populous in the state, none of the major chains has ever developed a full-size flagship store in that city comparable to the ones found in New York, Paris, or other world cities. The closest equivalent in Southern California is the cluster of three Macy's stores (women's apparel, men's apparel, and home and furniture) at South Coast Plaza in Costa Mesa. In Northern California, the most important shopping areas are Union Square in San Francisco, Stanford Shopping Center in Palo Alto, and Westfield Valley Fair in San Jose. In Southern California, the most important shopping areas are Rodeo Drive in Beverly Hills (mostly for window shopping as few visitors can actually afford anything), Westfield Century City, Santa Monica Place (and the adjacent Third Street Promenade), Beverly Center, South Coast Plaza, Fashion Island in Newport Beach, and Horton Plaza and Fashion Valley in San Diego. The Premium Outlets chain operates several factory outlet centers in California, of which the most important are located at Livermore, Vacaville, Gilroy, Camarillo, Cabazon, and Carlsbad. California is famous as the home of the Fry's Electronics computer retail chain, which operates superstores throughout Silicon Valley and in other suburban areas throughout the state. Unfortunately, most Fry's stores are not conveniently located from a tourist perspective and are very difficult to reach without a rental car. The stores closest to areas of interest to tourists are in Palo Alto (near Stanford University), Manhattan Beach, and Huntington Beach (near South Coast Plaza). As in the rest of the U.S., the leading convenience store chain in California is 7-Eleven. The two other major convenience store chains are am/pm stores (always found at Arco gas stations) and Circle K.
For basic supplies, try to use supermarkets and pharmacies if possible, as they have better selection and provide better value for your money than convenience stores. The major pharmacy chains in California are CVS, Walgreens, and Rite Aid. The major supermarkets in the Bay Area are Safeway, Lucky's, and Nob Hill Foods, while in Los Angeles, major supermarkets include Vons, Pavilions, Ralphs, and Albertson's. The state's inland metro areas feature smaller supermarket chains like WinCo and Raley's. Whole Foods Market is the leading organic/natural supermarket throughout the state; other organic/natural chains include Trader Joe's and Sprouts Farmers Market. Bristol Farms is the dominant upscale supermarket in Southern California (with a single NorCal store near San Francisco Union Square) while Draeger's is the dominant upscale supermarket in the Bay Area. The ubiquitous discount store chains Walmart and Target both offer some groceries (Walmart Supercenters and SuperTargets offer a full selection of groceries) and also usually have pharmacies on site. However, with the exception of the relatively new CityTarget stores in downtown Los Angeles and San Francisco, most of their stores are located in suburbs and are difficult to reach unless you have a rental car. The culinary style known as Californian Cuisine is noted for its use of fresh often local ingredients and imaginative fusion of several styles. The burrito also has its origins from California, born in the Mission District of San Francisco. Almost anything you can imagine can be found somewhere in California. Immigration has had a strong influence on California's culinary landscape, with the cuisines of The Americas and Asia heavily represented, and those of nearly every other country available to a lesser-extent. More "North American" fare includes everything from burger shacks to vegetarian, organic and even completely vegan restaurants; the Californian love for food has left it with one of the most diverse restaurant scenes in the North America. The large cities have the most variety, while things get simpler and more meat-heavy as you get more rural. Upscale restaurants can be found in nearly all large cities, as well as some of the smaller areas. Only the rural areas, which tourists rarely have interest in, are devoid of high-end establishments. Nearly all cuisines, from French to Japanese, can be found in each Californian city. The legal drinking and purchasing age of alcoholic beverages is 21. Under age drinking is taken very seriously so if you are in a club or bar and appear to be under 30 you should be ready to present identification showing your age. However, California is one of the 17 states that doesn't penalize a minor for consuming alcohol if he/she is discovered to have been drinking alcohol through his/her reporting a medical emergency for another under age drinker. California is known for its fine wines and gourmet beers. Napa, Sonoma and Mendocino are premier wine districts north of San Francisco, but there are others in the Central Coast region and even the San Diego region where suitable microclimates have been found. The inland Central Valley region has hotter summers and traditionally produced inexpensive bulk wines, but quality has been improving with winemaking innovations. Californians tend to view wine as a natural accompaniment of food or socializing, overlooking its alcoholic content more easily than with distilled spirits. However police crackdowns on drinking and driving are increasingly severe with roadblocks and random checks. Conviction for driving with a blood alcohol level over .08 percent is likely to bring serious legal and financial consequences. Drivers with lower blood alcohol can still be convicted for DUI (driving under the influence) if they fail field sobriety tests such as walking a straight line. For beer, California also has a large population of microbreweries. Sierra Nevada, located in Chico, is one of the biggest microbreweries in North America. In the Central Coast the midsized brewery Firestone Walker in Paso Robles is a good addition to the local wineries in the area. In San Diego, Stone Brewing Company offers a great variety of beers that can be purchased throughout the state. The Russian River Brewing Company, located in Santa Rosa, is home to a wide variety of beers that have received accolades worldwide. There are over 212 microbreweries in California. Occasionally, there will be an advisory issued for air stagnation, which is a phenomenon involving an air mass that cannot move and therefore stagnates over an area for an extensive period of time. Pollutants are often unable to be removed from the air and this often causes breathing difficulties for those with existing respiratory conditions. If you have a respiratory condition, refer to the National Weather Service website on air quality to see if any such advisories have been issued for the areas you might visit. Like many western states, California has had cases of hantaviral pulmonary syndrome, 42 confirmed cases in the state since 1993. Realistically, however, hantavirus is of very little concern to the traveler; but sensible precautions should be applied. Do NOT venture in a wild animal's den or handle any dead animals; particularly rodents, as rodents seem to be the primary vector of the illness. There is no cure for the disease, treatment mainly consists of supportive therapies. The main defense against the virus is prevention. Marijuana is now legal in California. Anyone must be 21 or older to consume, possess, or purchase marijuana - it doesn't matter if its for recreational or medicinal reasons and it is strictly enforced. DO NOT bring cannabis into any Indian reservation that has deemed it illegal, nor Federal enclaves as Federal law will be heavily enforced. There are four major types of law enforcement you may encounter in California. On state highways and freeways and some rural areas is controlled by the California Highway Patrol. CHP wears beige uniform with blue trim. All vehicles are either black and white or just a solid white color. The decals are a 5 star badge with the Highway Patrol decal lettering on that badge. Some officers also ride on motorcycles. In cities, especially large ones, you will encounter police officers from the relevant city police department. Police uniforms are usually black or navy blue. Most police departments drive Ford Crown Victoria cruisers or are currently transitioning to the Chevrolet Caprice or Dodge Charger. Unlike with many other states, California has extremely strict firearms laws at the state level. These range from "assault weapons" bans, to very heavy restrictions on carry permits. California does not recognize carry permits from any other state/territory, and getting a permit can vary greatly depending on what county/city someone is a resident of. Open carry of any firearm is universally outlawed with exception for police, military, certain permitted security guards, and hunters on federal hunting land. The state strictly enforces the gun laws, via the CHP. Violation of any of California's gun laws can result in severe penalties/fines/and confiscation of the weapon. Although Southern California is world-famous for sunny weather, much of California suffers from heavy fog in the morning during certain times of year, particularly the Central Valley and some smaller valleys in Northern and Central California. Even coastal areas in Southern California sometimes see fog in the summer (the notorious "June gloom"). Coastal areas in the Northern half of the state (including the Monterey and San Francisco bay areas) are even more prone to fog than the Southern half. Although the foggy season usually occurs in summer, fog can occur at any time, any day. Sunny weather at noon can quickly turn into a blanket of pea soup by 3-4 PM. On some days, the fog never clears out at all. Edward AFB is one of the biggest military bases in Southern California. This base is a detachment of Area 51. Since this area is under the control of the U.S military entry to the base is restricted and is open only to authorized military personnel and family members. Unauthorized entry will result in arrest. The city of Edwards is a restricted city as it is close to Edwards AFB. The city is for family members of authorized military personnel inside the base. California is filled with a very diverse group of people. Both Northern and Southern California have extremely different cultures, while the rural areas in the Central Valley and Eastern portions of the state differ even more significantly. Like much of the US, sensitive topics include immigration, race, gay rights, and politics. Know that California is predominantly highly progressive, and views that could be interpreted as bigoted are not widely tolerated. The region of Northern California between Sacramento and the Oregon border, is extremely conservative, socially and economically, and tends to lean very religious. The area resembles the South or midwest more than California. It is very rural outside of the cities of Redding and Chico, and there are pockets of remote and isolated mountain communities, as well as small towns that dot the Sacramento valley. Any progressive attitudes, public displays of affection between gay partners, talk of immigration, or any other liberal views, may be met with disapproval or outright hostility. While this is not the case with everyone, it's usually a good idea to not engage anyone in political discussion, unless you know them very well and are comfortable doing so. Some tourists may be taken aback that this region doesn't share California's largely progressive and forward attitudes. Arizona - Home to the Grand Canyon, Arizona borders California to the southeast across the Colorado River. Nevada - California's eastern neighbor is best known as the home of Las Vegas, although towns such as Reno and Carson City are also good day-trip opportunities for visitors wanting to explore the Silver State. Oregon - Sharing a border to the north, Oregon is home to impressive mountains and extensive forests. Hawaii - Many visitors to America's fiftieth state depart through California on their journey across the Pacific. Baja California - Those traveling across the border to Mexico can visit some of that country's most impressive sea and landscapes. This page was last edited on 24 April 2019, at 16:37.